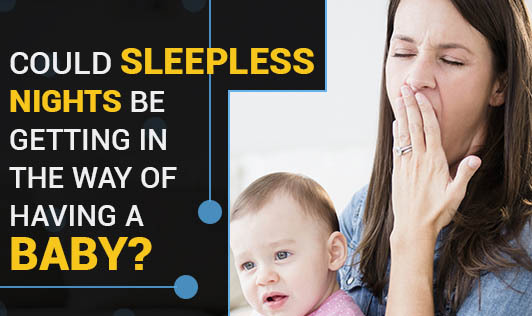 Could sleepless nights be getting in the way of having a baby? Trying to conceive since a long time, but haven't succeeded yet? Do a check on your lifestyle! There are many factors other than medical, which affect your ability to conceive. It applies to both the partners. Getting home late, staying up late for work, night shifts could be few of the reasons. What's yours? Find out how it defeats your goal to conceive. To conceive, you need good health. For good health, you need good food, a good amount of physical activity, and of course sound sleep! Studies have proven that insufficient rest/sleep is one of the most important factors affecting the health of a sperm as well as an egg. A healthy sperm and a healthy egg are required to create a healthy baby! If you are deprived of sleep, it shows that you might be overworked or under pressure of performing well or tensed about certain issues (personal and/or professional). It means that you are emotionally stressed. Being stressed for any reason does not help. In fact, it serves as a hindrance! Your body clock does not function well if you are not taking adequate rest. It slowly starts to suppress physical health. Physical, mental, and emotional well-being is mandatory for a healthy conception and a healthy tomorrow!